Happy New Year! and welcome to 2017. You might notice this newsletter looks a little different. As I mentioned last week I've been working on streamlining a few things, and the newsletter itself is one of those things. My hope is that it will be more readable, and ultimately more valuable to you. Most weeks the first article will be a full article. No "read more", you can read the whole thing right here. There'll still be a link to the article's official home on askleo.com for your comments, of course. I've removed several sections that didn't appear to be generating much interest. I've moved more of the boilerplate administrative text to the newsletter administration page. There'll still be a single ad in the newsletter each week. Naturally that means I continue to need your direct support, but aside from the ad I'll try not to nag you too much about it. Like what you see? Think it's all a horrible, horrible mistake? (I sure hope not!) Hit reply and let me know. Thanks, as always, for being here. Onward into the new year! This concern has me waffling over whether to use the https everywhere extension (which, by the way, is also available for the Opera and Vivaldi browsers, which you didn't mention in your video on the subject). While understanding the risks of your security software is important, it's equally important to realize that this concern applies to any and all software you might choose to install on your computer. These days, almost all software has an online component, even if it's just to check for updates. Should that online component be hacked, it could be used to download malicious software onto your machine, which can then do anything. While it might be obvious that hacked security software would be a bad thing, in reality, any software vendor that gets hacked runs the risk of causing damage in the form of malware being installed on the machines of all current users. So, absolutely be aware of your "anti-virus, VPN, or security extension" vendor, but be just as concerned about the software not necessarily related to security as well. As I said, it's a concern for every single service you use, and every single bit of software you install on your machine, right down to the operating system. Life is not without risk, and one of the ways we manage risk is to make sure we do business only with entities we trust. That's not to say we necessarily agree with their actions, but that their actions are transparent in such a way that we can trust them to do what they say they will, and do it with an appropriate level of security in mind. We begin by trusting that the services and software we use don't have malicious intent. We're assuming they're not out to "get" us; they're not explicitly out to exploit, harm, or otherwise take advantage of us. We also trust the services and software we use to know what they're doing, particularly when it comes to security. We assume they understand the security ramifications of their tools, and have taken appropriate and sufficient measures to ensure our privacy, safety, and security. This is difficult to judge objectively. For obvious reasons2 software vendors and online service providers don't specify their full range of security measures publicly. We need to decide how much we're willing to trust them with our information and activities based on reputation and track record. I might claim the second is more important than the first. There's no such thing as bug-free software, and there's no such thing as perfect security. In the face of security-related issues, how did the vendor respond? Was it with quick transparency, or ponderous obfuscation? Did it become apparent that their systems had been designed with security in mind, or was it clear they'd made some boneheaded decisions leading to eventual compromise? It's unrealistic for every computer user to have a detailed understanding of the security issues and risks associated with all the different kinds of software and services, online or off. As a result, it all comes down to trusted referrals and reputation. Perhaps more objectively, I trust the EFF – the suppliers of https everywhere. My trust is based on my understanding of the organization's goals, their history, and their online reputation. Will they have perfect software developers? Of course not – there's no such thing. But I do trust them to understand the security ramifications of their efforts – perhaps better than most – and to take appropriate steps to ensure that what they provide is solid and secure. I also trust them to react appropriately should an issue ever become apparent. Those are the same qualifications I apply to any software or service I use. It's one reason I haven't yet endorsed a specific VPN – I don't have enough of a track record with any of them to feel my opinion is worth anything. If pressed to make a decision, I'd defer to other resources I do trust – like the EFF, in this case – for their recommendations. For most people, things aren't nearly as bleak as this picture might paint. Most major vendors are reputable and trustworthy, and will do what they can, within the limits of technology and the scope of the law, to keep their services safe and secure from hackers or other types of intrusions. As long as you focus on getting reputable software from reputable sources, and maintaining your own security hygiene, it's not something the average computer user need lose sleep over. Related Links & Comments: What if My Security Software Vendor Gets Hacked? 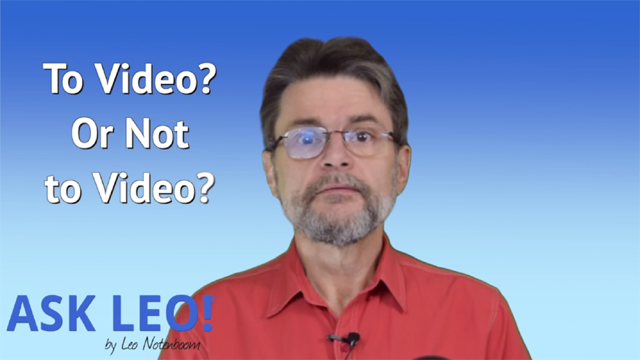 Continue Reading: To Video? Or Not to Video? Can you recommend/suggest a software program that will show me exactly all programs (showing or hidden) installed on my laptop?? Even more surprisingly? There's really no single definition of what an "installed program" is. Continue Reading: Is There a Way to List All Programs Installed on My Computer? Tip of the Day: What Is File Explorer, Anyway?